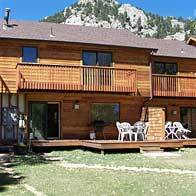 We list all of the Estes Park area Condos, Suites and Vacation Homes that directly serve Rocky Mountain National Park. 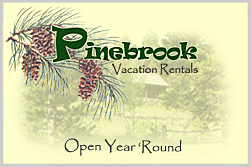 If you know of any campground that we do not have listed, please contact us. 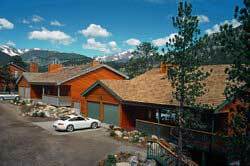 Colorado Rocky Mountain Rentals is a group of privately owned homes in Allenspark and Riverside. 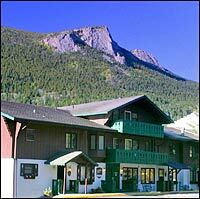 !5-25 miles of breathtaking scenic drive to downtown Estes Park and the main entrance to Rocky Mountain National Park. Homes range from 1 bedroom to 4 bedrooms in a variety of settings. Spread out in one of our two bedroom two bath loft units. The King bedroom has a full bath, gas log fireplace, 27” television, micro/frig, sitting area and a balcony facing our court yard and pool area. The upper unit has two beds with a ¾ bath, 19” television and a balcony that faces the mountains. Spacious one bedroom/spa or 2bed/2bath condos on Fall River. New in 2001. Each of our luxury condos are furnished with personality and unique character. Our condos feature king and queen beds, full kitchens, jetted tubs, and gas grills. A select few also offer a private hot tub and washer and dryers. From your deck is a spectacular view of the Fall River and our beautiful Colorado blue spruce trees. 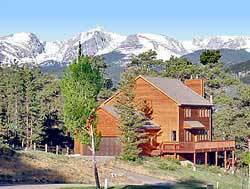 Estes Park Condos are your choice for a mountain vacation whether you sit by the river, enjoy an evening by the fireplace, a dip in your jetted tub or a romantic dinner delivered to your condo from one of Estes Park's Fine Restaurants. 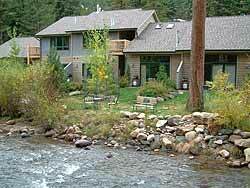 Enjoy clean, modern condos just steps away from downtown Estes Park and the beautiful Riverwalk. All condos are fully equipped … most with full kitchens and fireplaces … some with Jacuzzi tubs … and sleep from 4 to 10 people. 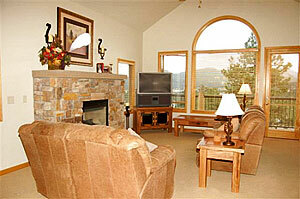 Each condo is beautifully decorated in mountain décor. 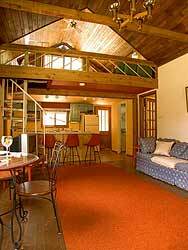 Located at the confluence of the Big Thompson River and Fall River, Lofts of Estes is ideal for romantic getaways or family reunions. Our condos range from cozy one-bedroom units that sleep four, up to large three-bedroom units that will accommodate up to ten people. No smoking and no pets, please. Visit our Website to view photos and check availability. Panoramic mountain views and richly-appointed condos await you! 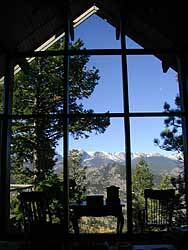 Relax in spacious one- two- and three-bedroom units (many with hot tubs) with some of the most beautiful views in all of Estes Park. Restaurant, lounge and the historic Marys Lake Lodge just steps away. Free Wi-Fi in every unit. Our Deluxe and Premium condos are fully furnished, beautifully decorated with exquisite tile work, have air conditioning, washers and dryers, and are designed for maximum comfort. The full kitchens feature modern appliances, granite countertops, and other fine appointments. We also offer economical Standard units for the budget-conscious. The Overlook combines modern luxury with spectacular mountain views and is perfectly located close to shopping, dining and entertainment. Each condo is fully furnished, beautifully decorated, and designed for maximum comfort. The full kitchens feature modern appliances, granite countertops, marble floors and other fine appointments. We offer one-bedroom units (790 sq.ft.) that sleep four, spacious two-bedroom units (1200 sq. ft.) that sleep six, and sprawling three- and four-bedroom units (over 2200 sq. ft.) that sleep from eight to ten people. Units are available with personal hot tubs, private garages and spacious decks to relax and enjoy the views. For the ultimate Colorado vacation experience, step up to The Overlook. Come to Ptarmigan Trail, and capture the splendor of the mountains as you relax in the king sized log bed. Experience the awesome views of Mt. Meeker and Longs Peak. Walk out onto the redwood deck, off the master bedroom or great room, to feel the serenity and marvel at the colors of the sunrise and sunset. If your relaxation style is to curl up on the oversized sofa, enjoy the magical fire in the fireplace, explore the many trails in the park, ski, sled or snow shoe on a wintry day or listen for the mating of the elk in the fall, Ptarmigan Trail will fill all your recreational needs. The custom built home has an efficient, fully equipped kitchen, microwave, washer/dryer, cable TV, VCR, telephone and linens. Lounge in the overstuffed furniture, relax by the fire and savor a deliciously prepared meal cooked on the outdoor gas grill. 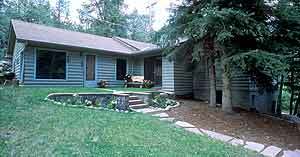 For those who want to keep in touch, the home is within cell phone range and high speed wireless (Wi-Fi) Internet. 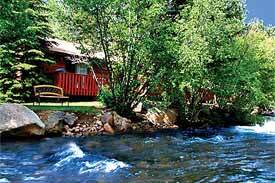 Trails West on the River is proud to offer you the choice of Luxury River Suites with in room Spas and Cozy cottages. 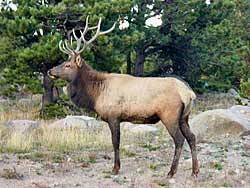 Enjoy Fishing, Hiking, Wildlife Viewing and the soothing sound of Fall River as it makes its way through Trails West. Take a dip in the outdoor hot tub after you enjoy a day experiencing Rocky Mountain National Park. 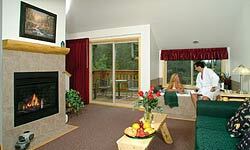 Our Cottages and River Suites feature Fireplaces, Kitchens, and Decks that overlook Fall River. 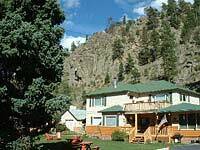 Conveniently located between downtown Estes Park and the entrance of Rocky Mountain National Park on the Fall River, you will find Restaurants, Horseback riding, Shopping and Family Entertainment all within a 5 minutes drive. Please visit our website for more information on our property. 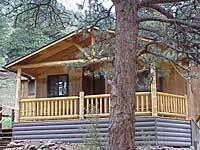 We invite you to stay at Trails West in Estes Park during your next family vacation or romantic getaway, your hosts Jeff & Kris. 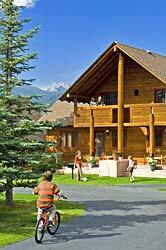 Our Spacious vacation homes and large condo's make a great retreat for your next family or business gathering. Enjoy the graciously appointed mountain d�cor, large meeting areas & kitchens. All have luxurious 310 thread count linen, wood or gas burning fireplaces, fully equipped kitchens, GREAT mountain views from your large PRIVATE decks, queen & king beds many featuring the Deluxe Tempur-Pedic mattresses. BBQ's, CCTV's, VCR/DVD's, Stereo's, Phones. Reserve private time in our relaxing sun room where you will enjoy the flicker of the fireplace while soaking in the hot tub, or book a body treatment at our beautiful Day Spa. Free High Speed Wireless Internet in all on-property units as well as a computer station in the lobby. 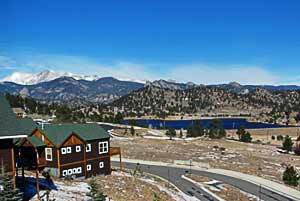 Aspen Winds is located midway between the shopping village of Estes Park and Rocky Mountain National Park. Overlooking Fall River, we offer One and Two Bedroom Suites, and Spa Suites which appeal to every vacationer needs. You can experience all the luxury, excitement and activity the area has to offer, or succumb to the lure of just relaxing in a perfectly picturesque setting on the riverfront. 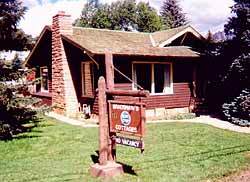 Bear Creek Vacation Condos is right on Fall River and offers the perfect combination of clean, comfortable accommodations, beautiful mountain views, and close proximity to Rocky Mountain National Park and downtown Estes Park. Each condo is modern, beautifully decorated, and has two bedrooms, two bathrooms, full kitchen, living room with fireplace, patio with gas grill, and will sleep up to six people. Luxury condos on Fall River. Close to Rocky Mountain National Park and downtown Estes Park. Enjoy the mountains in style! 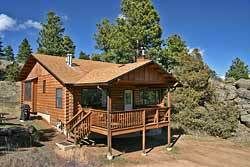 surrounded by an acre of pines and aspens. 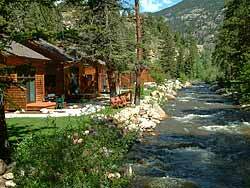 ...stay at the BEAR PAW CABIN, only 3 miles from Estes Park in the Big Thompson Canyon- on the "Private Waters" of the RIVER!! Two bedroom, Two baths, Two balconies too much to list. See display ad above. Luxury one bedroom/spa or 2 bedroom/2bath condos on Fall River with fireplaces, jetted tubs. Hot tubs in some units. Clean and modern. Walk to downtown! Spectacular Mountain and Lake views! Modern luxury condos close to shopping, dining and activities. Great off-seasons specials available. panoramic views of the snow capped peaks of the Rockies. 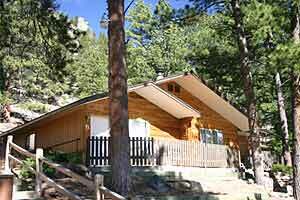 Luxury Spa Suites and Cozy cottages located on the beautiful Fall River in Estes Park.